Gases with higher GWP absorb more energy, per pound than gases with lower GWP. Sulfur Hexafluoride has lower GWP than Hydro fluorocarbons. The Global Warming Potential (GWP) was developed to allow comparisons of the global warming impacts of different gases. Specifically, it is a measure of how much energy the emissions of 1 ton of a gas will absorb over a given period of time, relative to the emissions of 1 ton of carbon dioxide (CO2). The larger the GWP, the more that a given gas warms the Earth compared to CO2 over that time period. The time period usually used for GWPs is 100 years. According to IPCC 5TH Assessment Report, GWP of Sulfur Hexafluoride is 23500 times that of CO2. GWP of Hydro fluorocarbons is around 13000 times that of CO2. Which of the following statements is/are correct regarding Biodiversity Hotspots? There are 5 Biodiversity Hotspots in India. Contain at least 1,500 species of vascular plants found nowhere else on Earth (known as “endemic” species). Have lost at least 70 percent of its animal species. Hence Statement 2 is correct and statement 3 is incorrect. There are currently 36 recognized biodiversity hotspots. Out of these 4 are in India. Solid plastic waste has been prohibited from import into the country excluding Special Economic Zones (SEZ) and by Export Oriented Units (EOU). Hence statement 1 is wrong. The NCAP will be a Five year action plan with 2019 as the first year. The programme may be further extended to a longer time horizon after a mid-term review of the outcomes. NCAP is implemented by WHO. NCAP is a part of National Action Plan on Climate Change (NAPCC). A time bound national level strategy for pan India implementation to tackle the increasing air pollution problem across the country in a comprehensive manner in the form of National Clean Air Programme (NCAP) was launched. City specific action plans are being formulated for 102 non-attainment cities identified for implementing mitigation actions under NCAP. Institutional Framework at Centre and State Level comprising of Apex Committee at the Ministry of Environment Forest and Climate Change in the Centre and at Chief Secretary Level in the States are to be constituted. WHO is not the implementing agency. NCAP is not a part of NAPCC. So, statement 4 is incorrect. The theme for International Day for the Preservation of the Ozone Layer 2018 is “Caring for all life under the Sun”. This event commemorates the date of the signing of the Montreal Protocol on Substances that Deplete the Ozone Layer. “Keep Cool and Carry on” is the theme of this year’s (2018) International Day for the Preservation of the Ozone Layer. It celebrates the progress in protecting the ozone layer and moves to phase out ozone depleting chemicals which are also potent greenhouse gases. The United Nations’ (UN) International Day for the Preservation of the Ozone Layer (World Ozone Day) is celebrated on September 16 every year. This event commemorates the date of the signing of the Montreal Protocol on Substances that Deplete the Ozone Layer in 1987. The Kigali Amendment to the Montreal Protocol is legally binding. Kigali amendment is to phase down the usage of HFC’s. The Agreement upholds the principle of Common but Differentiated Responsibilities and Respective Capabilities (CBDR & RC). It recognizes the development imperatives of high-growth economies like India, and provides a realistic and viable roadmap for the implementation of a phase-out schedule for high global warming potential (GWP) HFCs. On October 15, 2016, with the United States’ leadership, 197 countries adopted an amendment to phase down HFCs under the Montreal Protocol in Kigali, Rwanda. Under the amendment, countries committed to cut the production and consumption of HFCs by more than 80 percent over the next 30 years. The ambitious phase down schedule will avoid more than 80 billion metric tons of carbon dioxide equivalent emissions by 2050—avoiding up to 0.5° Celsius warming by the end of the century—while continuing to protect the ozone layer. 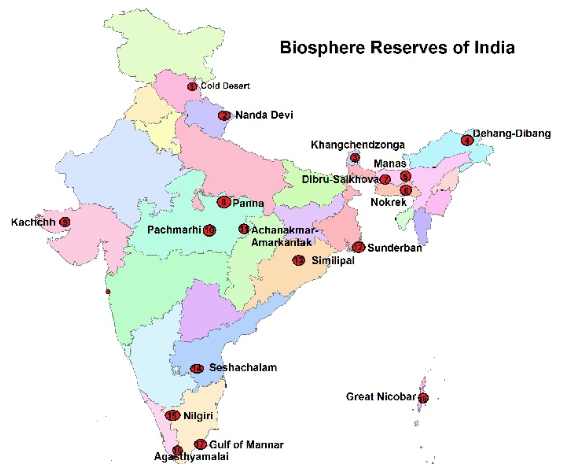 Thoroughly go through the list of 18 Biosphere Reserves designated by India. The device has filters for Particulate Matter removal, but lacks filters to remove activated carbon (charcoal). WAYU is developed by Council of Scientific and Industrial Research – National Environmental Engineering Research Institute (CSIR-NEERI) as a part of Technology Development Project being funded by Department of Science and Technology. Alpha diversity refers to a group of organisms sharing the same habitat. Beta diversity is the expression of diversity between habitats. Alpha diversity refers to the average species diversity in a habitat or specific area. It is dependent on species richness and species evenness. Beta diversity refers to ratio between local diversity and regional diversity. This is the diversity of species between two habitats or regions. Gamma diversity is the total diversity of the landscape. Keystone species have low functional dependency. Flagship species play a major role in creating or maintaining a habitat. A keystone species is an organism that helps define an entire ecosystem. It plays a critical role in maintaining the structure of an ecological community and whose impact on the community is greater than would be expected based on its relative abundance or total biomass. Keystone species have low functional redundancy. This means that if the species were to disappear from the ecosystem, no other species would be able to fill its ecological niche. The ecosystem would be forced to radically change, allowing new and possibly invasive species to populate the habitat. Flagship species are usually relatively large, and considered to be ‘charismatic’ in western cultures. Umbrella species are often conflated with keystone species. Both terms describe a single species on which many other species depend. The key distinction between umbrella species and keystone species is that the value of an umbrella species is tied to its geographic species range. Foundation species play a major role in creating or maintaining a habitat. Corals are a key example of a foundation species. These tiny animals grow as a colony of thousands and even millions of individual polyps. The rocky exoskeletons of these polyps create enormous structures around islands: coral reefs. Ecosystem engineer is a plant or animal that is very sensitive to environmental changes in its ecosystem. Autogenic engineers modify their environment by modifying their own biology. Allogenic engineers physically change their environment from one state to another. Like foundation species, ecosystem engineers contribute to the physical geography of their habitat. Ecosystem engineers modify, create, and maintain habitats. An indicator species describes an organism that is very sensitive to environmental changes in its ecosystem. Autogenic engineers modify their environment by modifying their own biology. Corals and trees are autogenic engineers. As they grow, they are a living part of the environment, providing food and shelter to other organisms. Allogenic engineers physically change their environment from one state to another. Beavers are a classic example of allogenic engineers. Beavers help maintain woodland ecosystems by thinning out older trees and allowing young saplings to grow. Ministry of Environment, Forest and Climate Change (MoEF&CC) implements National Mission for Green India (GIM) scheme for plantations along the highway sides and on vacant land along railway tracks. The Ministry of Road Transport & Highways has promulgated Green Highways (Plantation, Transplantation, Beautification & Maintenance) Policy-2015, under which plantations have been initiated in collaboration with Forest Departments and other agencies. Ministry of Environment, Forest and Climate Change (MoEF&CC) does not implement any scheme for plantations along the highway sides and on vacant land along railway tracks. MOEF&CC for afforestation and to increase forest cover in the country implements two Centrally Sponsored Schemes namely, National Afforestation Programme (NAP) and National Mission for a Green India (GIM). While NAP is being implemented for afforestation of degraded forest lands, GIM aims at improving the quality of forest/increase in forest cover besides cross-sectoral activities on landscape basis. These two schemes involve local people through Joint Forest Management Committees (JFMC) at the village level in the afforestation efforts and decision making in their area of implementation. The difference between the Community and Conservation reserve is that the former comprises community or private land and the latter comprises government land. The number of Protected Areas under Wildlife Protection Act (1972) has steadily increased over the years. Reserved/ Designated Forest Areas declared as such under the Indian Forest Act, 1927. Protected Areas declared under any of the four categories of the Wildlife Protection Act, 1972– National Parks, Wildlife Sanctuaries, Community Reserves and Conservation Reserves. Biodiversity Heritage Sites notified under the Biological Diversity Act, 2002. Wetlands identified and notified under Wetland (Conservation and Management) Rules, 2017. The amount of acid deposition in the form of wet deposition is higher in all the areas across the globe. Normal Rain water generally has a pH around 7.4 indicating that it is slightly basic in nature. Normal, clean rain generally has a pH value of between 5.0 and 5.5, which is slightly acidic. Which of the following correctly explains the term Bio-prospecting? Systematic exploration of biological diversity with the purpose of developing commercially valuable products. Appropriating a biological resource without obtaining prior informed consent of the country providing these. Systematic estimation of the biodiversity of a natural landscape. The method of valuation used in cost benefit analysis and environmental accounting. Bio prospecting refers to Systematic exploration, extraction and screening of biological diversity with the purpose of developing commercially valuable products. Contingent valuation refers to the method of valuation used in cost benefit analysis and environmental accounting. Bio piracy or misappropriation refers to appropriating a biological resource without obtaining prior informed consent of the country providing these. Ecologically Sensitive Areas (ESAs) have been notified by the Ministry of Environment, Forest and Climate Change. Notifications declaring areas as ESAs are issued under the Environment (Protection) Act 1986. Ecologically Sensitive Areas (ESAs) have been identified and notified by the Indian Ministry of Environment, Forest and Climate Change since 1989. Western Ghats is one of the ESA’s in India. All Algal Blooms are harmful. All Harmful Algal Blooms (HAB’s) are toxic. Not all algal blooms are harmful. Most blooms, in fact, are beneficial because the tiny plants are food for animals in the ocean. In fact, they are the major source of energy that fuels the ocean food web. Background: Harmful algal blooms, or HABs, occur when colonies of algae—simple plants that live in the sea and freshwater—grow out of control while producing toxic or harmful effects on people, fish, shellfish, marine mammals, and birds. The human illnesses caused by HABs, though rare, can be debilitating or even fatal. Cisgenesis (among plants) is the genetic modification of a recipient plant with a natural gene from a crossable, sexually compatible plant. Transgenesis is the genetic modification of a recipient plant with genes from any non-plant organism, or from a donor plant that is sexually incompatible with the recipient plant. Cisgenesis is the genetic modification of a recipient plant with a natural gene from a crossable, sexually compatible plant. Transgenesis is the genetic modification of a recipient plant with one or more genes from any non-plant organism, or from a donor plant that is sexually incompatible with the recipient plant. This includes gene sequences of any origin in the anti-sense orientation, any artificial combination of a coding sequence and a regulatory sequence, such as a promoter from another gene, or a synthetic gene. Transgenesis and Cisgenesis both use the same genetic modification techniques. (namely the introduction of one or more genes and their promoters into a plant). Cisgenesis involves only genes from the plant itself or from a close relative, and these genes could also be transferred by traditional breeding techniques. Silence zone is referred as areas up to 500 meters around such premises as hospitals, educational institutions and courts. As per existing rules, noise standards should not exceed 25 decibels (dB) in a Silence zone. Although originally, the Air (Prevention and Control of Pollution) Act 1981 was enacted exclusively for the control of air pollution, but by Amendment Act 1987, the problem of noise was also covered within the definition of air pollutants under this Act. In this Act no specific provision for the control of noise pollution has been made. Silence zone is referred as areas up to 100 meters around such premises as hospitals, educational institutions and courts. The noise standards in Silence zones are laid down as per existing rules, and should not exceed 45 decibels (dB) and 40dB during day and night, respectively. The Noise Pollution (Regulation and Control) Rules, 2000 is framed by the Central Government under the provisions of Environment (Protection) Act, 1986 read with Rule 5 of the Environment (Protection) Rules 1986. Hence statement 4 is correct. It leads to increase in the concentration of hydrogen ions and decreases the concentration of carbonate ions. Ocean water is naturally slightly acidic in nature. There are two important things that happen when carbon dioxide dissolves in seawater. First, there is an increase in concentration of hydrogen ions (due to chemical reactions), because of which the pH of seawater water gets lower as it becomes more acidic. Second, this process binds up carbonate ions and makes them less abundant. Carbonate ions that corals, oysters, mussels, and many other shelled organisms need to build shells and skeletons. Ocean pH has been slightly basic, averaging about 8.2. Today, it is around 8.1, a drop of 0.1 pH units, representing a 25-percent increase in acidity over the past two centuries. It is a global inter-governmental treaty that provides the framework for national action and international cooperation for the conservation and wise use of wetlands and their resources. It is the only global treaty to focus on one single ecosystem. The Ramsar Convention on Wetlands, also known as the Ramsar Convention, is a global inter-governmental treaty that provides the framework for national action and international cooperation for the conservation and wise use of wetlands and their resources. It is the only global treaty to focus on one single ecosystem. The Hope Mars Mission also called Emirates Mars Mission, is a space exploration probe mission to Mars built by the United Arab Emirates and set for launch in 2020. Mars Atmosphere and Volatile EvolutioN (MAVEN) mission was developed by NASA to study the Martian atmosphere while orbiting Mars. Mission goals include determining how the planet’s atmosphere and water, presumed to have once been substantial, were lost over time. ExoMars (Exobiology on Mars) is a two-part astrobiology project to search for evidence of life on Mars, a joint mission of the European Space Agency (ESA) and the Russian space agency Roscosmos. The Oort cloud, named after the Dutch astronomer Jan Oort, sometimes called the Öpik–Oort cloud, is a hypothetical cloud of predominantly icy planetesimals proposed to surround the Sun at distances ranging from 2,000 to 200,000 AU (0.03 to 3.2 light-years). It is divided into two regions: a disc-shaped inner Oort cloud (or Hills cloud) and a spherical outer Oort cloud. Both regions lie beyond the heliosphere and in interstellar space. The Kuiper belt and the scattered disc, the other two reservoirs of trans-Neptunian objects, are less than one thousandth as far from the Sun as the Oort cloud. The HAL Tejas is an Indian single-engine, multirole light fighter designed by the Aeronautical Development Agency (ADA) and Hindustan Aeronautics Limited (HAL) for the Indian Air Force and Indian Navy. It came from the Light Combat Aircraft (LCA) programme, which began in the 1980s to replace India’s ageing MiG-21 fighters. In 2003, the LCA was officially named “Tejas”. Tejas has a tail-less compound delta-wing configuration with a single dorsal fin. This provides better high-alpha performance characteristics than conventional wing designs. Its wing root leading edge has a sweep of 50 degrees, the outer wing leading edge has a sweep of 62.5 degrees, and trailing edge has a forward sweep of four degrees. It integrates technologies such as relaxed static stability, fly-by-wire flight control system, multi-mode radar, integrated digital avionics system and composite material structures. It is the smallest and lightest in its class of contemporary supersonic combat aircraft. It was intended to be powered by the GTRE GTX-35VS Kaveri, but had to be replaced with an off-the-shelf “foreign” engine, the General Electric F404. India, along with 23 other Indian Ocean Nations, participated in a major Indian ocean-wide tsunami mock exercise (drill) on 4th & 5th September, 2018. The Exercise, known as IOWave18, was organized by the Intergovernmental Oceanographic Commission (IOC) of UNESCO, which coordinated the setting up of the Indian Ocean Tsunami Warning and Mitigation System (IOTWMS) in the aftermath of the 26 December 2004 tsunami. Medhar is a bamboo basket-making community in Karnataka. Chola Naikar is a tribal community of Kerala. The project aims to transform agricultural production to generate global environmental benefits by addressing biodiversity conservation, land degradation, climate change mitigation and sustainable forest management. It uses fuel cells that produce electricity through a combination of hydrogen and oxygen, leaving behind only water and steam as residue. It produces zero-emission unlike other fossil based fuels. It uses fuel cells that produce electricity through a combination of hydrogen and oxygen, leaving behind water and steam. Hydrogen produced via electrolysis commonly costs roughly the same as natural gas and almost double that of diesel fuel; however, unlike either of these fossil-based fuels, hydrogen propulsion produces zero emissions. Admiral Sunil Lanba, Chairman Chiefs of Staff Committee and the Chief of the Naval Staff visited Rhode Island, USA on a bilateral visit from 18 to 22 September 2018 for attending the 23rd edition of the International Seapower Symposium (ISS) organised by the US Navy. The biennial ISS was first held in 1969 in Newport and was designed to allow naval leaders from around the world to meet and discuss common issues they faced, how to address these issues, and ultimately find solutions for them.